Lytag, manufactured first by pelletisation of a mixture of fly ash, bentonite and water, and then by sintering the spherical pellets at about 1 300°C, is used as coarse aggregate for producing lightweight plain and structural concrete mixtures. The weight of lightweight concretes is reduced significantly without compromising the structural integrity. The reduced dead load results in significant savings in the cost of foundations and reinforcement, as well as reduction in the sizes of columns, beams and slabs, which in turn reduce the overall volume of concrete and the costs of formwork and scaffolding. 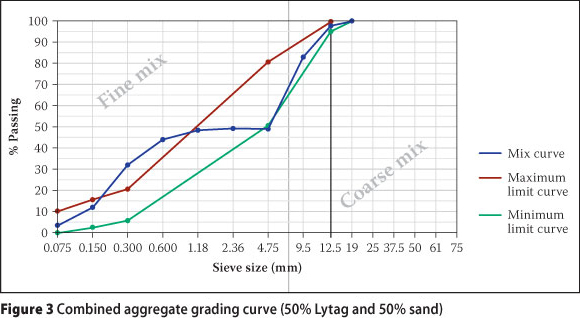 This paper reports on the results of an experimental study which consisted of designing, preparing and testing different mixtures of lightweight aggregate concrete considering four dosages of Lytag, used as coarse aggregate. It was found that the density and workability of concrete mixtures significantly decreased with increase in the dosage of Lytag. Concrete mixtures containing Lytag were found to be stronger than normal weight concrete. However, the strength of the lightweight aggregate concrete is found to be maximum at an optimum dosage of the Lytag. Lytag is a product used as lightweight coarse aggregate in producing lightweight concretes. Fly ash, bentonite and water are used as raw materials in manufacturing Lytag. The production of Lytag consists of mixing fly ash, bentonite and water together and then pelletising the mixture into spherical balls. Finally these rounded pellets are heated on a sinter strand to a temperature of around 1 300°C. This aggregate, with particle sizes typically ranging from 0.5 to 12 mm, is called sintered fly ash lightweight aggregate, more commonly known as Lytag lightweight aggregate (EuroLightCon 2000). The manufacturing of Lytag, using fly ash, has been frequently reported in literature (Moss 1976; Anon 1978; Buttler 1987). However, the production of other types of lightweight aggregate similar to Lytag has also been reported (Wainwright et al 2002; Boljanac et al 2007). Lytag is produced on an industrial scale by Lytag Ltd from its production units in the United Kingdom, Holland, Poland and China. Recently, Bulk Material International (BMI) has signed an agreement with Lytag Ltd for the marketing of Lytag lightweight aggregate in the Middle East. Swamy and Lambert (1981), in their study on microstructure of Lytag aggregate, reported that the overall structure of a Lytag pellet is basically made up of unreacted cenospheres, which are fused together at their points of contact and/or are surrounded by a solidified honeycomb type structure, probably formed when some of the raw materials became semi-molten and gases escaped through them. They have revealed through X-ray spectroscopy that the major chemical elements from which Lytag pellets are composed are silica and alumina, with smaller amounts of calcium, iron, magnesium and potassium. They found, furthermore, that an excellent bond forms between the Lytag pellets and a sand-cement matrix. 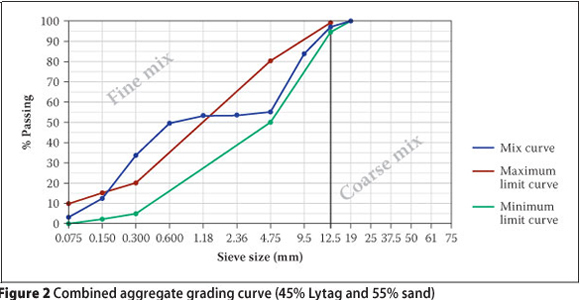 The microstructure, chemical composition, and particle size distribution of Lytag aggregate are important factors which affect the performance of Lytag lightweight aggregate concretes. The microstructure of Lytag aggregate affects its strength, absorption and pozzolanic activity. These three properties of Lytag aggregate jointly have an influence on the strength of lightweight concretes (Wasserman & Bentur 1997). Some of the important physical properties of Lytag aggregate, typically reported by EuroLightCon (2000), are as follows: porosity of particles (40%), particle density (1 400 kg/m3), 30-minutes water absorption (15%), and 24-hours water absorption (18%). The particle size distribution of Lytag aggregate is specified in terms of percentages of different individual fractions. An individual fraction means a portion of aggregate belonging to particles of a specific size range. In their study on properties of Lytag-based concrete mixtures, EuroLightCon (2000) typically considered different particle size distributions made up of the individual fractions, as follows: 0.5-4 mm, 0.5-6 mm, 4-8 mm, and 6-12 mm. Most of the mixtures studied by EuroLightCon (2000) were made with 60% of Lytag belonging to 0.5-6 mm fraction, and 40% of Lytag belonging to 6-12 mm fraction. Swamy and Lambert (1983) carried out a study on mix design and properties of concrete made from Lytag coarse aggregates and sand. They considered several initial trial mixtures with target strengths ranging from 20 to 60 MPa. Based on these trials they finally recommended three mixtures with target strengths of 30, 45 and 60 MPa with a slump in the range of 75 to 100 mm. For all three these mixtures, they kept effective water content and Lytag content constant at 175 and 715 kg/m3, respectively, and varied the cement content (250, 335 and 485 kg/m3), sand content (715, 645 and 515 kg/m3), and effective water/cement ratio (0.70, 0.53 and 0.36) respectively for mixtures having target strengths of 30, 45 and 60 MPa. 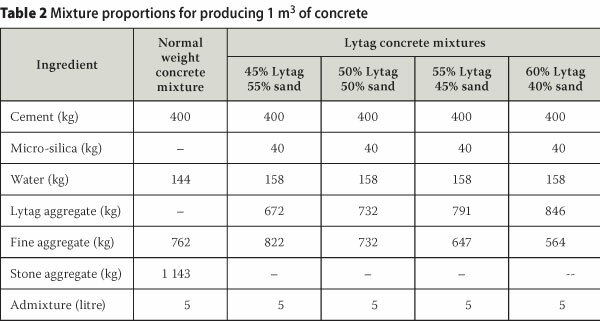 Lytag Ltd (2006) has published the data on typical mix designs for Lytag concrete. 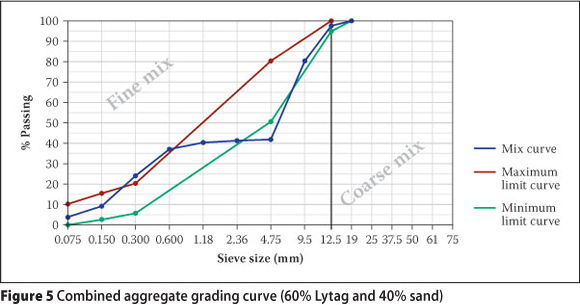 The comprehensive data on mix designs consists of the proportioning details of various types of Lytag concretes, such as: skip mix (Lytag granular / natural sand), pump mix (Lytag granular / natural sand), skip mix (Lytag granular / PFA / natural sand), pump mix (Lytag granular / PFA / natural sand), skip mix (Lytag granular / GGBS / natural sand), pump mix (Lytag granular / GGBS / natural sand), skip mix (Lytag granular / Lytag fines), and pump mix (Lytag granular / Lytag fines). Beattie (2005) reported the development of mixtures of Lytag self-compacting and pumpable concretes. Several researchers have reported the properties of Lytag concrete (Swamy & Lambert 1983; Bamforth 1987; Wainwright & Robery 1997; Bai et al 2004; Zhang 2011). Lytag concrete mixtures are typically used where low density concrete is required with the same structural integrity as that of normal weight concrete. Structural lightweight concretes, produced using Lytag as coarse aggregate and natural sand as fine aggregate, reduce unit weight by approximately 25% (oven-dry densities in the order of 1 750 kg/m3) over the normal weight concrete and still offer strengths exceeding 60-70 MPa. Reduction in the unit weight of concrete can lead to considerable cost savings, as the size and number of concrete sections, foundations and other structural members can be reduced. Compared to normal weight concrete, it has been found that Lytag concrete is easier to place, and has better compacting and finishing properties, enhanced durability, reduced coefficient of thermal expansion, improved insulating properties, and better fire resistance. The work on which this paper is based was conducted to obtain an optimum mixture of structural lightweight aggregate concrete made using Lytag as coarse aggregate and natural sand as fine aggregate. For this purpose, four mixtures of Lytag concrete were designed, prepared and tested, considering different percentages of Lytag and sand, keeping cement content and water/ cement ratio constant at their typically selected values. A mixture of normal weight concrete was also considered in the study to compare the properties of Lytag concrete mixtures with the properties of normal weight concrete. Type I cement (ordinary Portland cement) conforming to ASTM C150-07 was used in all the mixtures. Lytag aggregate having a maximum size of 19 mm and conforming to ASTM C-33-4 was used in all four mixtures of structural lightweight concrete. 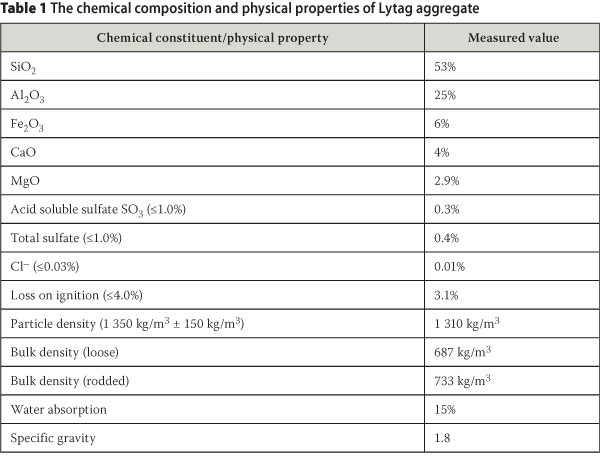 The chemical composition and physical properties of Lytag are presented in Table 1. The fine aggregate used in this investigation was dune sand. Specific gravity and water absorption of sand were measured to be 2.66 and 0.8% respectively. 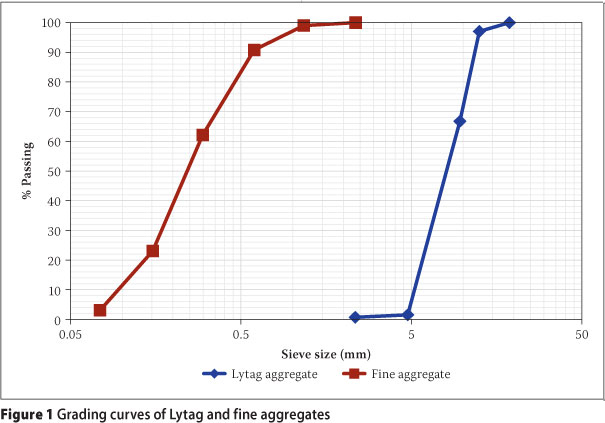 The grading curves of the Lytag and fine aggregates are shown in Figure 1. The crushed stone particles, with a maximum size of 25 mm, were used as coarse aggregate for preparing normal weight concrete. The specific gravity and water absorption of coarse aggregate were measured to be 2.65 and 1.65%, respectively. Potable water from the laboratory tap was used to prepare and cure the specimens. Superplasticiser was used in all the mixtures for achieving adequate workability. Four mixtures of Lytag concrete were designed, with the following percentage combinations of Lytag and sand: (i) 45% Lytag and 55% sand; (ii) 50% Lytag and 50% sand; (iii) 55% Lytag and 45% sand; and (iv) 60% Lytag and 40% sand. Combined grading of Lytag and sand was carried out for all four combinations in accordance with ASTM C330-4. 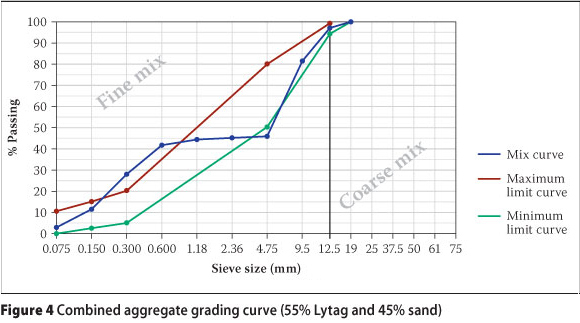 The combined aggregate grading curves obtained individually for all four mixtures of Lytag concrete are shown in Figures 2 to 5. For all four mixtures, cement content, micro-silica content, and water/cementitious materials ratio were kept constant at 400 kg/m3, 40 kg/m3 and 0.36 respectively. The cement content and water/cement ratio for the normal weight concrete mixture were the same as for the Lytag concrete mixtures. The coarse to fine aggregate ratio for normal weight concrete was kept as 1.5. For all five mixtures, the dosage of superplasticiser was kept as 5 litre/m3. The design of all the concrete mixtures was carried out using the absolute volume method, assuming entrapped air contents of approximately 2% for Lytag concrete mixtures and 1% for normal weight concrete mixtures. The proportions of all five mixtures considered under this study are presented in Table 2. Concrete mixtures were prepared by mixing the ingredients in accordance with ASTM C 192. Fresh concrete mixtures were tested for slump, air content and density in accordance with ASTM C 143, ASTM C 173, and ASTM C 138, respectively. After testing the fresh concrete mixtures, casting of cylindrical specimens was carried out for determining compressive strengths in accordance with ASTM C 39 after seven and 28 days of water curing. Oven-dry and air-dry densities of the specimens were also determined after 28 days of water curing. The results of the air content in fresh concrete mixtures are presented in Table 3. Normal weight concrete mixture with a maximum aggregate size of 25 mm has 1.8% air content against the approximately specified air content of 1.5% for 25 mm aggregate size. Lytag concrete mixtures with 19 mm maximum aggregate size should have air content of approximately 2%. However, it can be observed from Table 3 that the air content for the Lytag mixture with 45% Lytag aggregate is 2% and that air content increases with increase in the Lytag content. A plot of slump test results is shown in Figure 6. It was found that the slump decreases significantly with increase in the Lytag content due to the high water absorption capacity and lower density of Lytag lightweight aggregate. Compared to normal weight concrete, the reduction in the slump was found to be 23% with 45% Lytag, and 62% with 60% Lytag. The average decrease in the slump is around 15% for every 5% increase in the Lytag content. The variation in the density of fresh concrete with Lytag content is shown in Figure 7. 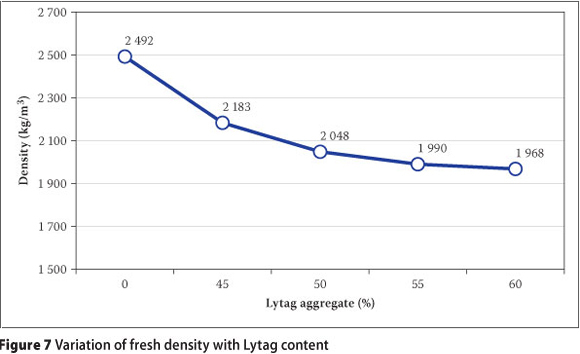 As can be seen from Figure 7, the fresh density of Lytag concrete is reduced by around 12% at a Lytag content of 45%, and the density decreases with an increase in the Lytag content to around 21% at a Lytag content of 60%. It can be noted that the reduction in density is more significant when the Lytag content was increased from 45 to 50% than the reduction in the density when the Lytag content was increased beyond 50%. The variation in air-dry and oven-dry densities of the concrete mixtures after 28 days of curing is shown in Figure 8. As with fresh density, the reduction in air-dry and oven-dry densities was also more significant when the Lytag content was increased from 45 to 50%. The reduction in air-dry and oven-dry densities is insignificant when the the Lytag content was increased beyond 50%. 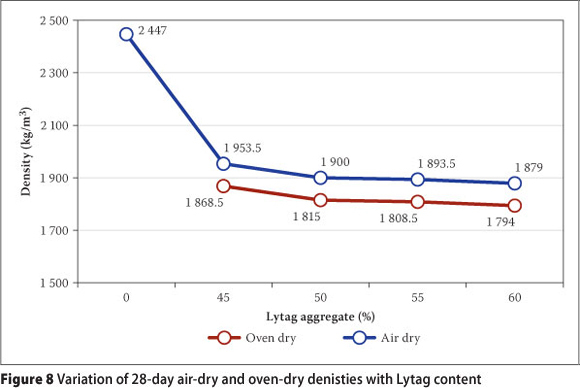 The reductions in air-dry and oven-dry densities at 50% Lytag content were found to be around 22% and 26%, respectively. The results of both fresh and hardened densities indicate that the 50% dosage of Lytag can be considered as the optimum dosage for reducing the density of Lytag concrete. 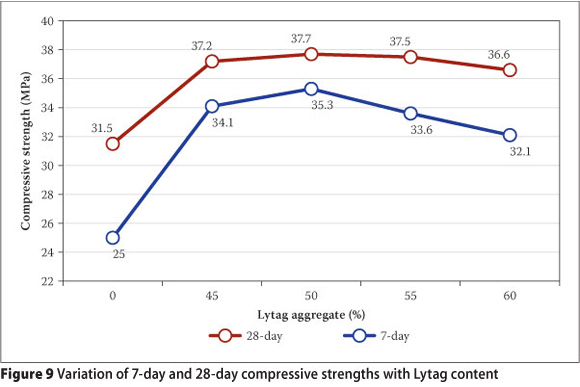 The variation in 7-day and 28-day compressive strengths of concrete mixtures with Lytag content is shown in Figure 9. It should be noted that the difference between 7-day compressive strength in normal weight concrete is more than that of Lytag concrete. Furthermore, the strengths of the Lytag concrete mixtures are more than that of normal concrete. 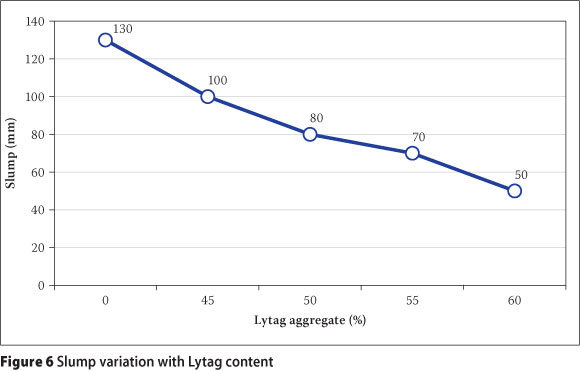 However, the strength of Lytag concrete increases with an increase in Lytag content only up to 50%, and then the strength decreases with increase in Lytag content. Therefore, from a strength point of view, the optimum dosage of Lytag was found to be 50%. All four mixtures of Lytag concrete fulfil the requirements of lightweight concrete, as they have dry densities of less than 1 900 kg/m3. At the same water/cement ratio and cement content, the Lytag concrete mixtures have better strength than normal concrete. However, at the same superplas-ticiser content the workability of Lytag concrete mixtures is significantly reduced due to higher water absorption and lower density of Lytag aggregate. At 50% Lytag content the reduction in the dry density is around 25%. Beyond 50% of Lytag content, the reduction in the density is insignificant. The strength of Lytag concrete is found to be maximum at 50% Lytag content. Therefore, the optimum dosage of Lytag aggregate can typically be considered as 50% (by mass). The authors gratefully acknowledge support received from the Department of Building Engineering and Technology, College of Architecture and Planning, University of Dammam, Saudi Arabia. ASSOC PROF SHAMSAD AHMAD, who holds a PhD in Civil Engineering from the Indiar Institute of Technology (IIT), Delhi, India, has been involved in several funded research projects. He has published over 40 research papers in refereed journals and conference proceedings, and has taught many graduate and undergraduate courses mainly related to mechanics, structural materials and durability of concrete structures. Presently he is Associate Professor in the Civil Engineering Department at the King Fahd University of Petroleum & Minerals, Dhahran, Saudi Arabia. PROF YASSIN SHAHER SALLAM holds a PhD (NDT Engineering) from the Rouen University Haut Normandie, France. He has published more than fifty scientific articles and held many positions, including Engineering Consultant, Head of Civil Engineering Department, Vice-Dean, and Dean. Presently he is Professor of Structural Engineering in the Building Science and Technology Department of the College of Architecture and Planning, University of Dammam, Dammam, Saudi Arabia. ISHAQ ABDUL RAZZAQ AL-HASHMI holds a BS in Building Engineering from the University of Dammam, Dammam, Saudi Arabia. Presently he is working as Assistant Lecturer in the Department of Building Engineering at the College of Architecture and Planning, University of Dammam.